Interrobang Theatre Project‘s The Pitchfork Disney is a triumph. British playwright Philip Ridley’s “gothic fairy tale” centers around two siblings who after years in hiding meet a sinister couple, Cosmo Disney and Pitchfork Cavalier. Treading a the waters between a dream and a nightmare, Interrobang’s production has earned praise from audiences and critics throughout Chicago – including a Jeff recommendation. To put it plainly, you would be doing yourself a disservice by not seeing this show. It is the highest compliment I can give this production to say that it almost made me sick. Everything is so uniquely unsettling. Haley (Aislinn Kerchaert) and Presley (Fred Geyer) are two halves of a whole – twins playing off each other with kenetic energy that reminded me of Newton’s Cradle with it’s give and take nature. Technically, the show is perfectly balanced – credit going to director Jeffry Stanton’s extreme eye for detail. Nothing and everything seems out of place in this surreal play. 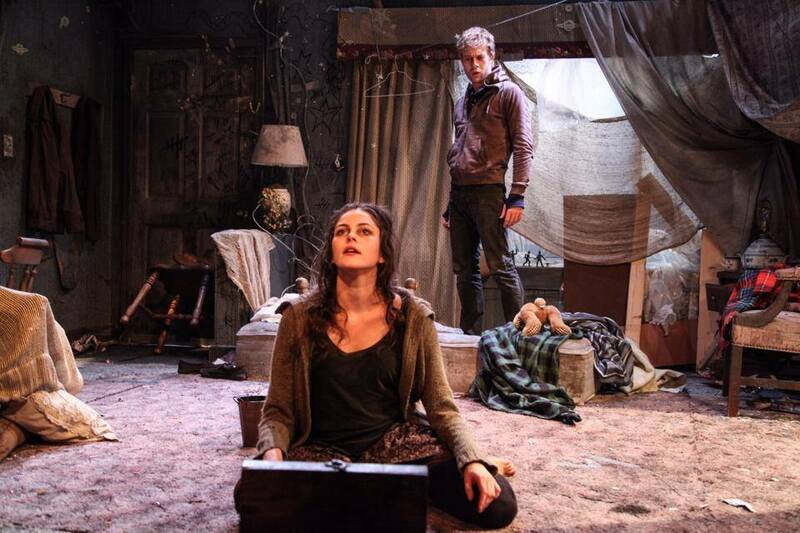 I was particularly impressed with choices of Lighting Designer, Claire Chrzan and Sound Designer, Christopher M. LaPorte – not forgetting Scenic Designer, Stephen Carmody’s playground of texture. Costume Designer, Noel Huntzinger creates a brilliant look for Hayley and Presley, but really impresses with the chilling costumes for Cosmo Disney and Pitchfork Cavaliere, played by the talented Kevin Webb and Mark Lancaster respectively. Lancaster’s harrowing howl was particularly memorable – and Webb commands the space with a brilliant confidence. It is difficult to pry your eyes off of him at times, but when you do you are thrilled to be met with Geyer’s performance as Presley – who commands his own sort of child-like power in his struggle to regain control of the fever-dream script. The Pitchfork Disney plays from Feb 6th to March 2nd. Tickets are $10-20 and are available for purchase at http://www.athenaeumtheatre.org/ or by calling the Anhenaeum’s Box Office at 773-935-6875.